LGBTQ Americans find themselves in a position we haven’t been in for nearly a decade: fighting against an administration that wants to turn back the clock on LGBTQ rights. This sadly signals to others that it is permissible to try to stop the progress we’ve all fought so hard to achieve locally and nationally. The Spring to Action agenda begins next week in Springfield and continues in cities throughout the state. 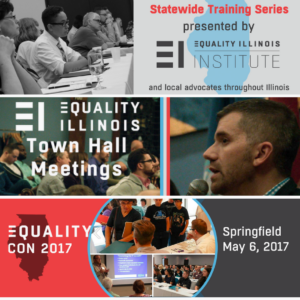 In the coming weeks, Equality Illinois will host a series of trainings on LGBTQ issues, engage in town hall forums, and sponsor EqualityCon 2017 in Springfield for a daylong conference. Local LGBTQ and allied organizations are cosponsoring the trainings, town halls and EqualityCon. Events are scheduled in Springfield, Peoria, Carbondale, Bloomington-Normal, and Metro East.